Input text: 1st house is -4 feet above the ground. 2nd small house is 8 feet behind and -4 feet left of the 1st house. it is on the ground. a yard is -135 feet left of and 45 feet in front of the 2nd house. it is -4.2 feet above the ground. 3rd house is -164 feet left of and -3.3 feet above and -1 feet in back of the yard. the ground is grass. a driveway is -4 feet in front of the 2nd house. a white car is -1 feet in front of the 2nd house. it faces back. 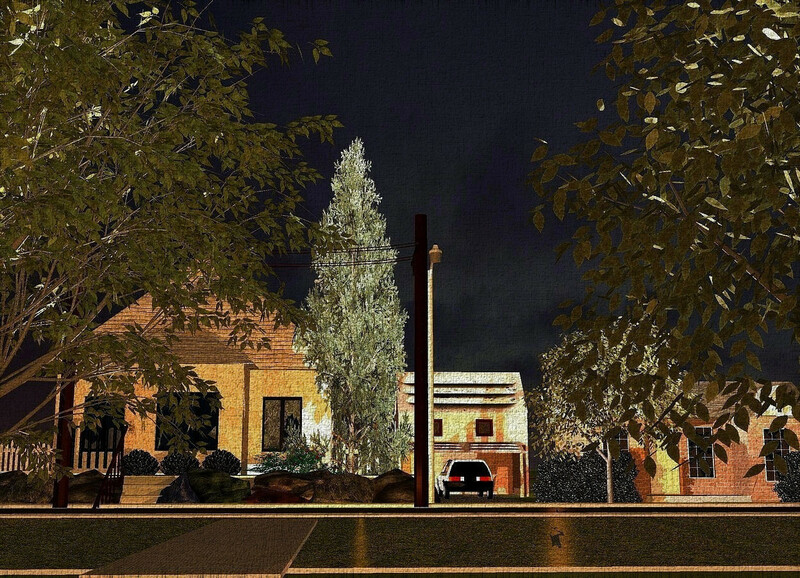 a streetlight is 3 feet left of and -3 feet in front of the driveway. 1st 30 feet tall and 10 feet wide spruce tree is 3 feet left of and -43 feet in front of the driveway. 2nd small tree is 6 feet in front of and -9 feet left of the 1st house. it is on the ground. a 16 feet long cement path is 18 feet in front of and 5 feet left of and -13.4 feet above the streetlight.the sun is black. the camera light is wicker brown. a coral light is -5 feet left of and -3 feet above and -2 feet in back of the 1st house. the ambient light is sisal brown. 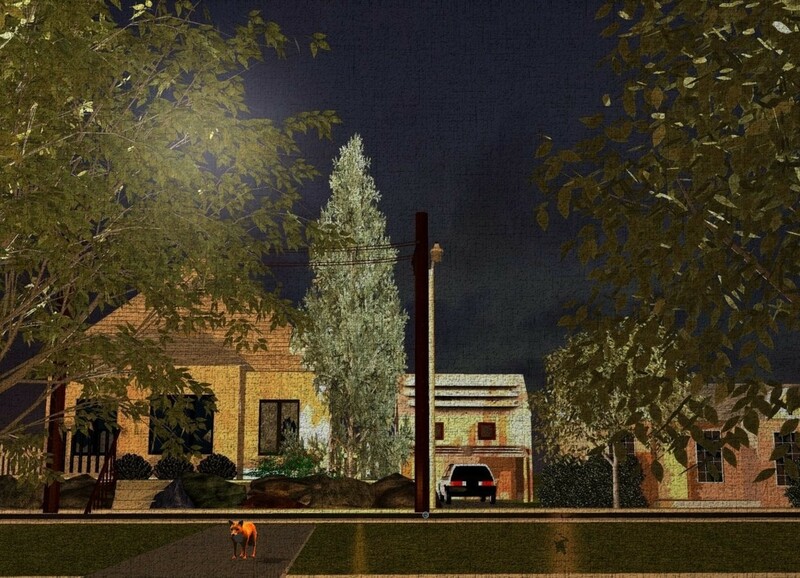 a honey gold spot light is 1 feet in front of and 3 feet left of and -13 feet above the streetlight. 3rd tree is 25 feet in front of and -50 feet left of and -25 feet above the 3rd house. 4th tree is 5 feet right of the 3rd tree. a sea blue light is 2 feet left of the 4th tree. a 17 feet tall telephone pole is -20 feet right of the streetlight. a petrol blue light is in front of the 3rd tree. Thanks, I wanted to get the night visitor in the scene too but alas my render timed out. There was a fox that would run across the road each night then pass down the east side of the house on it's way to the farmland behind the house. :-) I miss our foxes. I haven't heard their barks in a long time.